It was an extremely controversial decision when Paramount gave Roberto Orci the director’s chair for the upcoming Star Trek 3. But it was nevertheless a genuine shock when the news broke recently that Orci would no longer be helming the sequel. 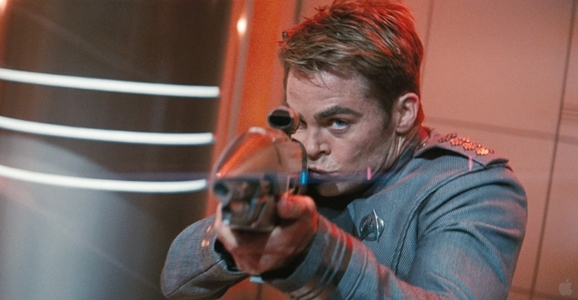 With Orci sidelined, who would take up the baton to get the next Trek sequel across the finish line, ideally in time for a 2016 release timed to the franchise’s 50th anniversary? Apparently Paramount’s shortlist is now down to five potential directors: Rupert Wyatt, Morten Tyldum, Daniel Espinosa, Justin Lin, and Duncan Jones. The names come from Deadline, who report that Rupert Wyatt is currently Paramount’s top choice, and that they have already taken meetings with him about the possibility. This wouldn’t be the first time Wyatt got to play in a beloved science fiction sandbox — he directed 2011’s Rise of the Planet of the Apes, a flick that surprised many by proving to be far better than anybody had reason to expect from an Apes resurrection at this point. It was followed up by this past summer’s Dawn of the Planet of the Apes, directed by Matt Reeves, and the revived franchise is set to continue in a third film in 2016. Wyatt is a solid choice, if not an inspired one, but nor would he likely be a controversial hire, which might work as an olive branch to lure back Trek fans riled up by J.J. Abrams’ brand of Trek. Morten Tyldum is a name few are likely to be familiar with at this point. That may soon change, as he directed this year’s The Imitation Game, starring Benedict Cumberbatch as genius mathematician Alan Turing. Cumberbatch of course played an inexplicably anglicized Khan in Star Trek Into Darkness, so Tyldum is already one Kevin Bacon away from the Trek franchise. Tyldum’s 2011 action thriller Headhunters is a blast, and you can check it out on Netflix Instant if you want to get a feel for Tyldum’s style. Headhunters, on the other hand, is a far cry from a mega-budget Star Trek film, and Paramount very well might want to go with more of a “name,” especially given how much is riding on the next film. Daniel Espinosa directed the 2012 Denzel Washington/Ryan Reynolds flick Safe House. It was a passable action movie but didn’t exactly blow the doors off, so I’m actually kind of surprised to find Espinosa’s name in the running for such a high-profile gig. However, Espinosa has recently been filming Child 44, a dramatic thriller set in Stalinist Russia and starring Tom Hardy and Noomi Rapace. It’s entirely possibly he knocked that one out of the park enough that he caught Paramount’s eye. Justin Lin has four Fast & Furious flicks under his belt, so he could definitely deliver on the action front. His name was also mentioned in some of the earliest rumors about who would take up the Trek 3 baton after J.J. Abrams jumped ship to Star Wars. That being said, hiring him probably wouldn’t please any of the Trek fans hoping the third film might correct course back toward the franchise’s more cerebral roots. The best of the Trek films combine epic action with smart storytelling, and whatever you think of Abrams’ two Trek flicks, “smart” is likely not on your list of adjectives to describe them. The Fast & Furious franchise, in spite of being hugely successful, is one of those properties that people love to pick on, so if Lin gets the job, he’d certainly be a more popular pick than Orci among the Trek faithful, but not necessarily by much. The last choice listed by Deadline is actually the guy I’m most rooting for: Duncan Jones. He’s twice proved his sci-fi bona fides with the excellent Moon and the surprisingly fun Source Code. He also made extensive use of models on Moon, something that’s always nice to see in an age when CGI is the go-to solution to pretty much everything, whether it’s the best solution or not. Jones also now has experience working with a larger budget, courtesy of the Warcraft movie that’s due in theaters in 2016. He’s a solid filmmaker and storyteller with a proven skill at working within the realm of science fiction, and both Moon and Source Code were considerably smarter than much of what makes up big-screen science fiction these days. I think he would be an inspired choice, and definitely the best pick of these five, at least in my rarely humble opinion. Two names that aren’t on the list are Edgar Wright and Jonathan Frakes. Wright, best known for the Blood and Ice Cream trilogy of Shaun of the Dead, Hot Fuzz, and The World’s End, was one of the first names bandied about after it was announced Orci was off Star Trek 3. I think he’d also be a solid choice, but — at least according to Deadline — he’s not on Paramount’s shortlist. Next Generation vet Frakes has emerged as a fan-favorite candidate for the job, and has actually already contacted both Paramount and Abrams (who remains as a producer on Trek 3) to express his interest. If you haven’t been following Frakes’ career outside of his Next Gen jumpsuit, he’s racked up an extensive directorial resume over the years, helming both First Contact and Insurrection, as well as episodes of TV shows such as Falling Skies, Agents of S.H.I.E.L.D., and Castle. That said, he was always going to be a long shot. Bring in Uwe Boll and let’s get this party started.